» East-west ‘avenues’ — but why? Ninth Avenue was once a simple “street,” as the old concrete curb still has it. It wasn’t always thus, as you notice when you keep your eyes on the ground when you walk around the old parts of town. 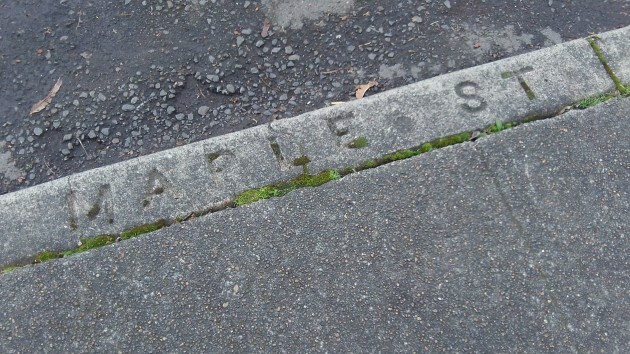 When the streets were built, maybe up to a century ago, the workers often inscribed the street names on the concrete curbs. However old those curbs are, the inscriptions remain. And they tell us that the numbered avenues in the old town were not avenues at all. They were streets, just like their north-south counterparts. So why the change, and when did it take place? As for the reason, I’m inviting old-timers to scrounge around in their memories and come up with the answer. But as for the timing, Gordon Steffensmeier in the city’s engineering section discovered something. He looked, in vain, for an ordinance or city council resolution that made the change. “But it seems that it must have happened around that timeframe.” Certainly does. I’m grateful for the information and hope that digging it up didn’t keep Gordon from more urgent work. Here’s Maple Street at Ninth. What would be confusing about two intersecting “streets”? Visualize a town like Fargo, ND, where about all the streets & avenues are simply a number. such as 3rd, 4th etc. It makes it much easier to find 411 3rd. I love street numbering for all the usual practical reasons but mostly because I can have my own personal feeling about each street without having to resist someone else’s intrusive notion about that street. 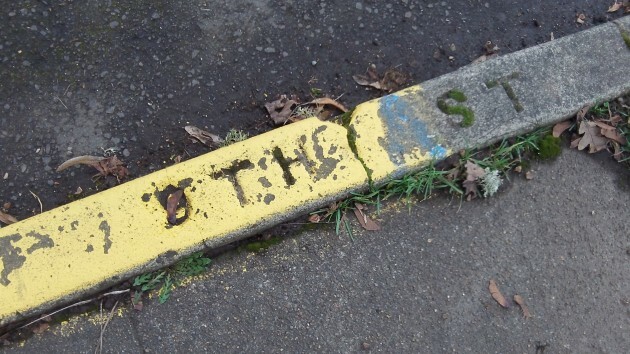 “SW 36th Avenue” comes with my own story, probably not well articulated into words. “Dr. John Q. Politician Street” or “Heavenly Fragrance Drive” would ruin it. When I was a teenager long before GPS and web maps, I lived in an almost-all-number city, rode my bike everywhere for exploration (as I still do), made that personal mental map without having to de-twist my sense of geography and carry a paper map everywhere. Bicycles are the perfect way to become aware of and attached to any place larger than a few blocks – slow enough, easy to stop, easy to look around, but also fast enough to cover a whole city. Out here in the country I grew up with county roads with numbers, although a few had names, for instance Seven Mile Lane and Peoria Road the rest were number. Actually, I am not sure about Peoria Rd because what is now called Fayetteville Drive was locally known as Peoria road because it ran between Shedd and Peoria. Anyway, we lived on Route 4. In the early 70’s it was decreed that we should have names on our roads. So, for those “roads” that did not already have a name the county started delivering names. Most of these byways became either Roads or Drives. I was told by someone (I dis-remember who) that drives mainly ran east and west and roads ran north and south. In general, that is the case. As an aside, the county decided to give our surname to the road that runs in front of our farm because, they said, our three plus story warehouse had been a landmark since 1940 and was used as a reference point for the county road crews. The neighbors were less than excited about living on “Pugh Road,” probably for several reasons, not the least which may have been just the sound of it when spoken out loud. The resolution was that the wives along the road got together (to include mine) and came up with Green Valley Road. had one left over because, when they found a short gravel road that didn’t have a name and they put a sign up on one end that says Pugh Road and the other end goes unmarked. I’ll let you city folks decide how your streets, avenues, courts and circles got their name. When I was a kiddie, and maybe a bit later than 1950, Scio changed its street names very reluctantly. This was a state mandate. Part of it was fire department convenience, tourist convenience, and also I expect a bit of silly neatness. So when we were done, wheeler was no more and the avenues had names arranged alphbetically. I figured it was okay because wheeler has a lot things named after him, but this was sort of our founder as in the wheeler addition. I think I was right to support the idea because it was coming. Why spend energy in a delaying action. Maybe we can temporarily rename them for a day on our birthday. Maybe the city council back then made rules as randomly as the current city council does, without an eye on the future.